Decoy Open winner Nigel Baxter. In the Decoy Lakes Saturday open match the Beastie Lake produced some huge nets. Leading the way from peg nine was Nigel Baxter, who caught shallow on pellet and in the margins with sweetcorn for 210lb 10oz. Fenland Rods winner Dave Garner. Tony Evans came second with 165lb 3oz from peg three followed by Alan Major on 126lb 10oz. 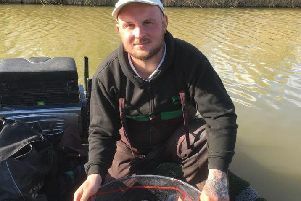 The fishery’s Sunday match switched over to Six Islands and again it was Baxter on top, this time with 191lb 1oz again fishing shallow with pellet and taking a lot of fish in the margins from peg four. Runner-up was Shaun Coaten with 171lb 1oz from peg 18, then came Lee Marlow with 163lb 10oz. I had an invite to fish the Fenland Rods match at North View Fishery, Gedney Hill at the weekend which I readily accepted as its a venue I have not been to for several years. It was tough going for some, including me but I have to say it’s a fishery well worth a visit - very clean, well kept and obviously very popular judging by the amount of anglers enjoying the day. Top rod in the match was the in-form Dave Garner, whofished a pellet and paste approach on rod and line tactics to weigh in 105lb 11oz. Second was John Smith on 74lb 6oz, then came Peter Parlett with 69lb 15oz. The Peterborough & DAA match on the North Bank was for the Hospital Cup. The winner was Dave Moisey on peg 10 with one big bream and one small roach for a weight of 5lb 4oz. Second was Dave Norville with 2lb 8oz followed by Mike Smith on 1lb 15oz. The next Peterborough & DAA members match will be at Stibbington on September 10. To book call Mike on 07749 904318.